Debbie Hadley is a science educator with 25 years of experience who has written on science topics for over a decade. Shark attacks aren't as common as the news media would have you believe, and fear of sharks is largely unwarranted. The tiger shark, however, is one of the few sharks known to attack swimmers and surfers unprovoked. It's sometimes called the man-eater shark, for good reason. The tiger shark is one of the shark species most likely to attack a human unprovoked, and is considered one of the most dangerous sharks in the world for that reason. Tiger sharks are one of the "Big Three" aggressive shark species, along with great white sharks and bull sharks. Of 111 reported tiger shark attacks, 31 were fatal. The great white shark is the only species that attacks and kills more people than the tiger shark. Why are tiger sharks so dangerous? First, they inhabit waters where humans swim, so the chances of an encounter are greater than with deep-water shark species. Second, tiger sharks are big and strong, and can easily overpower a person in the water. And third, tiger sharks have teeth designed for shearing their food, so the damage they inflict is devastating. What Do Tiger Sharks Look Like? The tiger shark is named for the dark, vertical stripes on either side of its body, which are reminiscent of a tiger's markings. These stripes actually fade as the tiger shark ages, so they can't be used as an identifying feature of every individual. Young tiger sharks have dark blotches or spots, which eventually merge into stripes. For this reason, the species is sometimes known as the leopard shark or the spotted shark. The tiger shark has a stout head and body, although narrower at the tail end. The snout is blunt and somewhat rounded. Tiger sharks are among the largest species of sharks, both in length and weight. Females are larger than males at maturity. Tiger sharks average 10-14 feet in length, but the largest individuals may be as long as 18 feet and weigh over 1,400 pounds. They're generally solitary, but sometimes congregate where food sources are plentiful. How Is the Tiger Shark Classified? 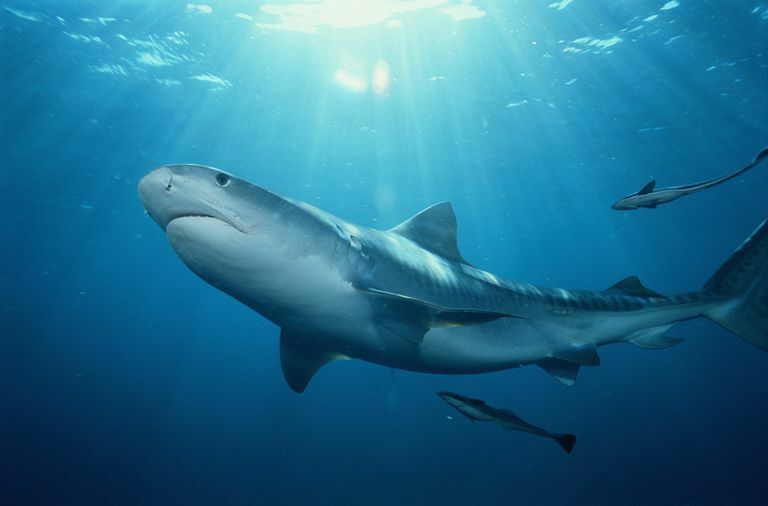 Tiger sharks are the only extant species of the genus Galeocerdo. Tiger sharks mate, with the male inserting a clasper into the female to release sperm and fertilize her eggs. The gestation period for tiger sharks is believed to range from 13 to 16 months, and a female can produce a litter every two years or so. Tiger sharks give birth to live young, and have an average litter size of 30 to 35 shark pups. Newborn tiger sharks are highly vulnerable to predation, including by other tiger sharks. Tiger sharks are ovoviviparous, meaning their embryos develop inside eggs within the mother shark's body, the egg hatches, and then the mother gives birth to live young. Unlike in viviparous organisms, tiger sharks don't have a placental connection to nourish their developing young. While carried within the mother, the egg yolk nourishes the immature tiger shark. Where Do Tiger Sharks Live? Tiger sharks inhabit coastal waters, and seem to prefer areas that are murky and shallow, like bays and estuaries. During the day, they usually stay in deeper waters. At night, they can be found hunting near reefs and in shallows. Tiger sharks have been confirmed at a depth of up to 350 meters, but generally aren't considered a deep water species. Tiger sharks live throughout the world, in both tropical and warm temperate seas. In the eastern Pacific, they may be encountered from the southern California coast to Peru. Their range in the western Atlantic Ocean begins near Uruguay and extends north to Cape Cod. Tiger sharks are also known to inhabit waters around New Zealand, Africa, the Galapagos Islands, and other areas of the Indo-Pacific region, including the Red Sea. A few individuals were even confirmed near Iceland and the U.K.
What Do Tiger Sharks Eat? The short answer is whatever they want. Tiger sharks are solitary, nocturnal hunters, and they don't have a preference for any particular prey. They'll eat just about anything they encounter, including fish, crustaceans, birds, dolphins, rays, and even other sharks. Tiger sharks also have a tendency to consume garbage floating in the bays and inlets, sometimes leading to their demise. Tiger sharks also scavenge for carrion, and human remains have been found in their stomach contents. Humans pose a far greater threat to sharks than sharks do to humans. Almost a third of the world's sharks and rays are endangered and at risk of extinction, due mainly to human activities and climate change. Sharks are apex predators―top-of-the-food-chain consumers―and their decline can tilt the balance of organisms in marine ecosystems. Tiger sharks are not endangered at this time, according to the International Union for Conservation of Nature and Natural Resources (IUCN), although they are identified as a species "near threatened." Tiger sharks are frequent victims of bycatch, meaning they're killed unintentionally by fishing practices intended to harvest other species. They're also fished commercially and recreationally in some parts of their range. Although finning tiger sharks is prohibited, it's likely a number of tiger sharks still die from illegal fin harvesting. In Australia, tiger sharks are baited and culled near swimming areas where shark attacks are a concern. "Tiger Shark," University of Florida, Florida Museum website. Accessed online June 11, 2017. 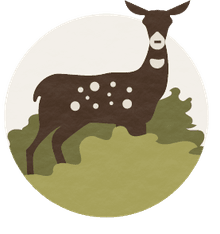 "Galeocerdo cuvier," IUCN Red List of Threatened Species website. Accessed online June 11, 2017. "Statistics on Attacking Species of Shark," University of Florida, Florida Museum website. Accessed online June 11, 2017. "Tiger Shark," NOAA Fisheries Fact Sheet. Accessed online June 11, 2017. "Species: Galeocerdo cuvier, Tiger shark," Smithsonian Tropical Research Institute website. Accessed online June 11, 2017. "Ovoviviparity," Support Our Sharks website. Accessed online June 11, 2017. What Is the Biggest Fish in the World?